Saida Juana Mendez-Bernardino, 27, Hilda Cruz, 6, and Stephanie Cruz, 4 were killed in a traffic collision on Highland on Wednesday morning. We’ve started a fundraising campaign provide funeral expense assistance for the family of the mother and her two young daughters who died in a traffic collision on Highland at Willoughby in Hollywood on August 29. We have setup this campaign to make it easier for our readers to contribute — and we’ll do the legwork for you to make sure the funds are going to the right place. On Friday, we delivered the first $2,500 in contributions to the family of the victims. We’re continuing to raise funds with a goal of $5,000 (perhaps a little bit more so that we can give the family $5,000 net of any overhead fees for credit cards and such). The victims have been identified as Saida Juana Mendez-Bernardino, 27, Hilda Cruz, 6, and Stephanie Cruz, 4, all from Los Angeles. 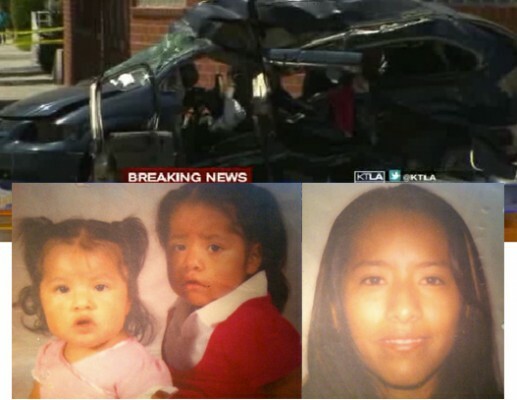 Mendez-Bernardino had been driving her oldest daughter to school, according to the Los Angeles Times. One daughter died at the scene. The mother and other daughter died a short time later at a hospital. Another, 11 year old daughter had just been dropped at school moments before the collision. The driver that caused the crash had a suspended license for failure to appear, speeding and using a mobile phone while driving. He had drifted or turned into opposing lanes of traffic. We have confirmed with LAPD that the family involved in the accident does need financial help and we have been in touch with the contact person provided by LAPD. ALL FUNDS DONATED LESS FEES WILL BE FUNDED – even below the “goal” amount, however once we reach the goal the fees are lower. At least that is my understanding on how this works. After 7 days, once the funds are released, they will be deposited into the bank account that has been established for the family. There are some fees for making a donation through this service so we will also post the bank account info here once available in case you want to donate directly that way so 100% of funds go to the family. Again, none of the fees will benefit Weho Daily — they are credit card fees, paypal fees, etc. Under no circumstances will Weho Daily keep any of the funds collected here. If any complications arise in the process of providing these funds to the appropriate individual, they will be donated to a crime victims fund or other non-profit agency that might help victims of tragedies such as this. Thank you to the WeHo Daily for its leadership in the days after the accident. I am a friend of the Bernardino family and very grateful for the support. The family continues to deal with the tragedy. They are doing as well as can be expected in light of what happened. We will soon know if we have sufficient funds to pay for the funeral expenses and will update your readers.